Lisbeth Dahl is a beloved Danish design house, which produces everything from cake stands to umbrellas. If you like vintage, you’ll love their collections. If you like Pinterest, you’ve probably seen Lisbeth Dahl plastered all over your screen (even if you didn’t know it). New collections are presented twice a year; stockists include John Lewis and well-heeled gift shops. The problem with Lisbeth Dahl products is that… you guessed it, the price tags are ratcheted waaaaaaaay up high. 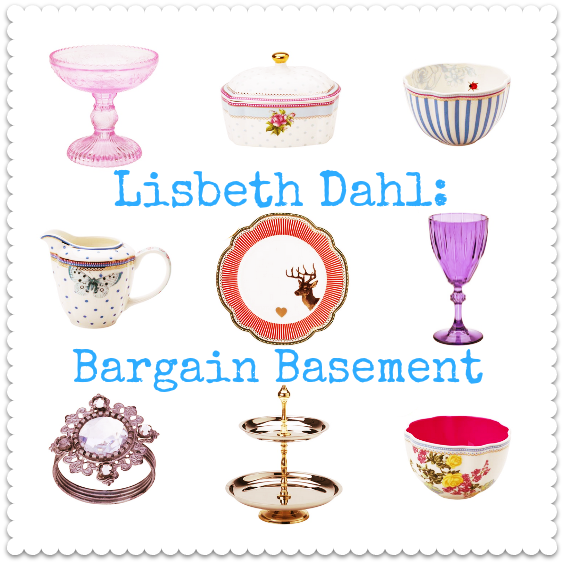 For this reason, I want to spread the news far and wide that discount buying site ACHICA currently has a Lisbeth Dahl sale on – with some exceptionally good markdowns on cake stands, tea sets, plates, glassware and more. The promotion finishes at 6 am on Tuesday 4 February, and a number of the items have already sold out on ACHICA, so don’t dilly-dally if any of the bargains there catch your fancy. Here are a few of my favourites. Just click on any of the pictures to view this sale range on the ACHICA site. Lisbeth Dahl stripey bowl, box of 4 – £32 reduced from £80. Lisbeth Dahl Lovely butter dish – £7 reduced from £24. Lisbeth Dahl Birdie cream jug – £5.25 reduced from £17.50. Lisbeth Dahl gold and silver cake stand – £18 reduced from £45. Lisbeth Dahl glass cake stand with floral pattern – £12 reduced from £30. Lisbeth Dahl Apron, Rose & Stars – £15 reduced from £37.50. Lisbeth Dahl glass bowl on foot, rose – £6 reduced from £15. Lisbeth Dahl Florence bowl, box of 4 – £32 reduced from £80. Lisbeth Dahl Dottie creamer – £5.25 reduced from £17.50. Lisbeth Dahl Diamond glass set, rose, box of 6 – £12.50 reduced from £31.25. Lisbeth Dahl Diamond white wine glass set, lilac, box of 6 – £20 reduced from £50. Lisbeth Dahl Diamond small glass set, red, box of 6 – £12.50 reduced from £31.25. Lisbeth Dahl set of 4 crystal napkin rings – £7.50 reduced from £25. Lisbeth Dahl Birdie sugar bowl and lid – £6 reduced from £20. Lisbeth Dahl set of 5 ballerina cake decorations, rose – £2.25 reduced from £7.50. Lisbeth Dahl Holiday plate set #19, box of 4 – £30 reduced from £75. Lisbeth Dahl Birdie espresso cup and saucer set, box of 4 – £22 reduced from £55. Lisbeth Dahl Love plate set #19, box of 4 – £28 reduced from £70.